Carl Winston Lumbly is an American film, stage, and television actor. He is most known for the roles of Marcus Dixon in the television drama Alias, Martian Manhunter in the animated series Justice League and Justice League Unlimited as well in the direct-to-DVD film Justice League: Doom, and as Det. Marcus Petrie on Cagney and Lacey. Born to Jamaican immigrants in Minneapolis, Minnesota, Lumbly graduated from South High School there and Macalester College in nearby St. Paul. At one time he was a journalist in Minnesota, when he got an acting job while on assignment for a story about a workshop theatre and stayed with the improvisational company for two years (along with then-unknown Danny Glover). His first major role was Detective Marcus Petrie on the television series Cagney and Lacey (1982–1988). In 1987, he garned positive reviews for his portrayal of Black Panther Party co-founder Bobby Seale in the HBO television movie Conspiracy: The Trial of the Chicago 8. 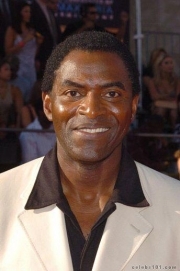 From 1994-1995, Lumbly starred as the main character in the short-lived science fiction series M.A.N.T.I.S.. Perhaps his most visible role was as Marcus Dixon in the American television series Alias (2001–2006). Other prominent roles include providing the voice the for Martian Manhunter on Justice League and Justice League Unlimited, and a recurring role on L.A. Law as a college professor unjustly accused of first-degree murder. He also appeared in Superman: The Animated Series as the voice of the Mayor of Metropolis on the episode "Speed Demons" in 1997, and as an alien military general in the episode "Absolute Power" in 1999. He also appeared as the voice of the villain Stalker on Batman Beyond. In 2000, Lumbly portrayed activist and Congressman Ron Dellums in the Disney's Channel's original movie, The Color of Friendship. Although the movie was focused on Dellums's daughter's friendship with a white South African girl, the film also discussed Dellums's role in ending apartheid in South Africa. Lumbly most recently appeared as Lt. Daniel "Bulldog" Novacek in the television series Battlestar Galactica. Lumbly also plays a role in the cinematic of video game Command and Conquer 3 's expansion pack Kane's Wrath''. Whole or part of the information contained in this card come from the Wikipedia article "Carl Lumbly", licensed under CC-BY-SA full list of contributors here.